Michael Parfett conservation studio, restoration of Erard and Naderman Harps, old pianos, gilding and repairs to modern harps and instruments, furniture and frames." 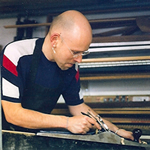 Michael Parfett has been running a busy conservation studio in central London for nearly 20 years, working on European and world furniture, old and new harps and pianos, as well as gilded and polychromed finishes to furniture, frames, objects and objects d'art. Recognised around the world as a leading restorer of antique harps, Michael Parfett has a selection of 18th and 19th century harps for sale including Erard, Naderman and other makes. From a major rebuild and refurbishment to minimal intervention, Michael Parfett takes on all types of conservation and restoration work and can give condition reports for collections and individual items. Major projects have included work with the Federal University of Minas Gerais Belo Horizonte in Brazil, advising Government organisations on major conservation projects including restoration of the 18th century Benedictine monastery in Olinda which was later exhibited in the Guggenheim Museum in New York. A founding member of UKIC gilding and decorative surfaces section and until recently chair of the Gilding and Decorative Services Group of ICON (Institute of Conservation), he has organized and lectured at major conferences and workshops. Michael also has wide experience in teaching and instruction, including seminars on gilding and restoration.